1) This paper is the introduction chapter of FIG publication “Administering Marine Spaces: International issues”. This publication is result of FIG Commissions 4 & 7 Working Group 4.3. FIG publication 36, Copenhagen 2006, ISBN 87-90907-55-8. Good governance is based on recognition of the interests of all stakeholders and inclusion of their interests where possible. Interests can be expressed in a variety of ways, for example: sovereignty, jurisdiction, administration, ownership (title), lease, license, permit, quota, customary rights, aboriginal rights, collective rights, community rights, littoral rights, public rights, rights of use, and public good. Coastal states are challenged with managing the multidimensional tapestry of these interests (and perhaps others) in the coast and offshore. Over the next few decades those responsible for marine policy and administration have been challenged with trying to understand this tapestry and communicating it to the various decision makers and stakeholders. However, addressing the complexities associated with these interests solely from a boundary delimitation perspective does not necessarily improve the governance of marine spaces. This paper explores a number of legal, technical, and stakeholder issues related to governing marine spaces. The governance of any geographical area, including marine spaces, is actually the management of stakeholder relationships with regard to spatial-temporal resource use in the pursuit of many sanctioned economic, social, political, and environmental objectives. Good governance is based on recognition of the interests of all stakeholders, and inclusion whenever possible. Governance involves setting priorities that may establish hierarchies of interests, but the basis is recognition of what is excluded, as well as what is given priority in certain situations. These interests can be expressed in a variety of ways, for example: sovereignty, jurisdiction, administration, ownership (title), lease, license, permit, quota, customary rights, aboriginal rights, collective rights, community rights, littoral rights, public rights, rights of use, and public good. One feature of being a coastal state is that there is a multidimensional tapestry of these interests (and perhaps others) in the coast and offshore. Marine administrators are challenged with trying to understand and communicate this to the various decision makers and stakeholders. A marine cadastre, or other marine information management system, serves to meet the information requirements for governance of marine spaces by facilitating the management of thematic information and their boundaries and limits. In past research we initially assumed that spatial delimitation of interests would help clarify resource management and use regime in marine spaces. What was learned from our research was that this approach was very limited and probably impossible. The main reason is that there are numerous marine boundaries, and four dimensions at least had to be considered. Drawing lines on charts was often not feasible, legally valid nor of value. The legal profession taught us that there were a myriad of boundaries: at least one if not more for every resource and every resource use. Starting from the boundary perspective was a nonstarter. the need to develop tools better than the traditional cadastre to govern marine spaces effectively. To address the listed considerations, this chapter will explore the governance of marine spaces by focusing on a number of stakeholder issues, legal issues, and technical issues. However what is meant by governance will first be discussed. The governance of marine spaces is the management of stakeholder activities in these spaces. To optimize this management and to address stakeholder issues requires that effective governance frameworks be in place. Collaborative, cooperative, and integrative governance are improved frameworks for dealing with stakeholder issues. Traditional governance models have been based on a management science approach where the premise is that leadership of organizations (public, private or civic) is strong, and have good understanding of their environment (future trends, rules of the game, and the organization's goals) [Paquet, 1999]. As such, the leaders provide direction for the groups they represent. A hierarchical governance model is one such example. This form of governance, usually practiced by the state or some other governing authority, is usually enacted through policies, laws and regulations [Hoogsteden, Robertson and Benwell, 1999; Paquet, 1999; Savoie 1999]. This hierarchical model assumes a top-down approach is always best, whereas subsidiarity (i.e., the principle based on the assumption that individuals are better able to take care of themselves than any third party) might alternatively provide a better solution in some circumstances. Subsidiarity would support, for instance, the devolution of responsibilities to citizens by provincial/state authority (or to states/provinces by federal authority) as much as possible unless they were unable to manage [Rosell, 1999; Chiarelli, Dammeyer and Munter, 1999]. Renaissance-style independency forms of governance that utilize informal terms, and the devolution and decentralization of decision-making to achieve its objectives [Paquet, 2000]. These models are by nature subversive to those organizational structures based on traditional models of governance. They challenge the view that an "omnipresent person or group has monopoly on useful knowledge and can govern top down" [Paquet, 2000]. “The process whereby a society, polity, economy, or organization (private, public or civic) steers itself as it pursues its objectives” [Centre on Governance, 2000; Paquet, 1994; Paquet, 1997; Rosell, 1999]. “The process of decision-making with a view to managing change in order to promote people's wellbeing” [Kyriakou and Di Pietro, 2000]. “The set of processes and traditions which determine how a society steers itself thereby according citizens a voice on issues of public concern, and how decisions are made on these issues” [Meltzer, 2000]. “The guidance of national systems shared by ensembles of organizations rooted in the three sectors (economy, polity, civil society and community)” [deBlios and Paquet, 1998]. The means by which local, regional, national and international communities organize themselves and subsequently respond to issues of interest to members of those communities. It involves leadership on the part of government and the use of policy and programs to control and influence activities within communities [Manning, 1998]. A number of points essential to governance are alluded to in the above definitions. Firstly, governance is all encompassing, touching virtually every area of human existence. Secondly, governance can take many forms, and takes place on many levels. This is supported by Masson and Farlinger . Each form of governance makes use of facilitative processes, mechanisms and systems to pursue goals. Thirdly, governance is about the provision of direction towards the achievement of objectives. The direction taken must take cognizance of the interests, rights, responsibilities, and differences among all stakeholders. how to manage their input, including keeping the dialogue going over time. This can be summarized as defining the governance process in terms of liaising, listening, learning, and leading. Too often agencies responsible for programs and projects focus only on the last step. One of the greatest limitations in most marine programs and projects is having a narrow approach to stakeholder participation. This is often driven by issues such as: time constraints, lack of knowledge, single issue focus, or governmental silos. It is particularly true in coastal region were there may be jurisdictional uncertainty, overlaps, and gaps. However, the top down approach, while perhaps being the easiest to manage, is also the least likely to have sustainable results. Spending time at the local level in the initial stages of marine activities (e.g., through workshops and town hall meetings) can help to identify the breadth of stakeholders and their interests. Effective consultation is not just “this is what we are going to do for you.” Frequently, information meetings allow question periods but do not include processes for taking and putting input to use. A variety of means can be used to obtain input including web portals. The information provided for consultation also has to have the right message and medium for the variety of different audiences. Once input is obtained, consensus building strategies are required to establish priorities and identify appropriate solutions. Frequently the priorities are different at the local, regional, and national level. Whoever is leading also has to listen and learn if the differences are to be accommodated or resolved. And this is an on-going process that will effect the life of the governance activity. Significant delays in establishing a Marine Protected Area (MPA) because a First Nation (aboriginal) group was excluded in the initial discussions: The MPA program is led by the federal government which has taken nearly ten years to recognize and understand the importance of provincial, municipal, and private interests [Leroy, 2002]. Ineffectiveness of a provincial policy to limit coastal development because of lack of trust at the local level despite numerous “information” meetings: The result was that policy implementation was delayed for 10 years and inappropriate construction increased in the meantime to avoid the expected regulations [Nichols, et al., 2006]. Lack of comprehensive coastal zone management programs due to uncertainty and fragmentation in jurisdiction, administration, ownership, and use of coastal resources: There are not well established arrangements for collaboration among all of the government agencies at the several levels involved and each activity causes a new process of stakeholder identification and consultation. From an information perspective this has led to a lack of consistent data about interests and boundaries along the coast. management of spatial (geographically referenced) and other types of information to support all of the above functions. This approach highlights the role of the legal frameworks within each nation in managing marine space. These frameworks are generally multi-layered ranging from the United Nations Law of the Sea Convention (UNCLOS), international customary law, and international treaties to national, state, and local level laws derived from tradition, legislation, and the courts. The United Nations Law of the Sea Convention [UN, 1982] establishes a framework for national and international governance by, among other provisions, establishing limits of national resource use and control. However, each nation must also have a set of procedures for allocating resources within these zones. In many cases, this depends on tradition and legal frameworks. These frameworks may be defined by the local, regional (provincial/state) and/or national legal systems and constitutions. Even when only government interests are considered, the resulting marine/coastal legal arrangements are usually complex. Sovereignty: supreme rights of ownership; entities holding sovereign rights reserve the right to impose their will on others and to usurp the ownership rights of others (e.g. by expropriation). In international law, to be sovereign means that a state “must be able to exercise jurisdiction, over a determinate tract of territory,...and have legally independent powers of government, administration and disposition over that territory.” [Walker, D, 1980]. Legislative Jurisdiction: “[t]he sphere of authority of a legislative body to enact laws and to conduct all business incidental to its law-making function.” [Black, 1979] or that aspect of power where rules (i.e. rights, responsibilities and restrictions) of social, cultural, economic and political behavior are defined, and wherein it is determined how and when those rules are applied and enforced. Administrative Authority: “[t]he power of an agency or its head to carry out the terms of the law creating the agency as well as to make regulations for the conduct of business before the agency; distinguishable from legislative authority to make laws.” [Black, 1979]. It is therefore the means by which jurisdictionally defined rules are applied and enforced. Title or Ownership: the means whereby the owner of the rights to the object of property has the just possession of that object (although actual possession or occupation may be by another). Where sovereign, jurisdictional, and administrative rights are normally rights vested in governments and their agencies, title may be held by different levels of government, groups, and individuals. Depending on the legal system, ‘ownership’ may be full or partial and usually consists of derivative interests (e.g., lease, use, license, mortgage). increasing recognition of the rights of indigenous groups and other groups in coastal and marine resource. 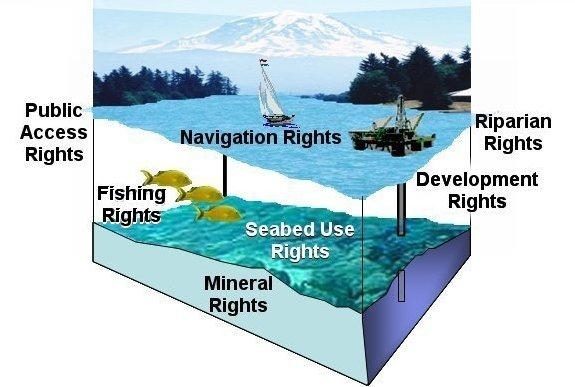 There are virtually no rights of exclusive use or ownership in marine space: The three dimensional aspect of ‘a parcel’ is more apparent (Figure 1) than on land because rights are usually allocated for specific portions (e.g., seabed, water column) or specific activities (e.g., fishing, navigation). The interests usually coexist and even this coexistence may change over time (e.g., seasonal rights). This increases the number of stakeholders that must be considered for any marine/coastal area. It also results in myriad boundaries of jurisdiction, administration, ownership and use – in some instances, a boundary or limit for each specific resource or activity. exclusive rights of surface ownership such as freehold, which include fixtures (e.g., trees, buildings, and at least some subsurface rights). This fragmentation of interests is also usually reflected in (or caused by) the institutional structures of government. Thus the Ministry of Fisheries may administer an area of marine space for fishing and related activities and the same space is subject to different regulations for navigation that is regulated by the Ministry of Defense. One result is the fact that information about the stakeholders, their interests, and activities is widely scattered throughout government. Complex private and public interests: Private land interests frequently extend into marine space (e.g., rights for wharf development, littoral rights associated with upland ownership, traditional rights to areas for fishing through weirs). In many cases these rights are undocumented and have been acquired through traditional use. Furthermore, these rights are not usually well understood by planners, managers, and policy makers without a water law background. An additional complexity is that there are emerging or increasing interests such as the public right to access beaches and to have environmental protection of endangered habitats. Such public interests typically clash with private interests, and in many cases neither are well defined or documented. no one agency (and in some cases no specific level of government) has the responsibility to lead data management activities in both coastal land and marine spaces. Boundaries and limits are not well delimited: Boundaries and limits in the coastal zone are typically made with reference to physical features, many of which are difficult to clearly define or relocate (e.g., high water, the shoreline, the normal baseline). The land water interface is ambulatory and traditionally most boundaries and limits followed the motions of that interface. Today greater emphasis is placed on ‘fixing’ these lines. This may be driven by law (e.g., nations generally declare their national baselines under the Law of the Sea at a point in time for offshore boundary delimitation); by institutional structure and practice (e.g., the municipal coastal boundaries defined on a map); or by technology (e.g., the desire to establish co-ordinates or boundaries for geographical information systems). However, for the most part, the law only delimits boundaries when, and if, an issue arises. Therefore without court decisions or specific legislation the location of many boundaries is a matter of considerable interpretation [Sutherland, 2005]. Information is an essential technical component of the governance of marine spaces. Information on resources that currently exist, the nature of the environment within which those resources exist, as well as on the users and uses of those resources is always a requirement for effective evaluation and monitoring of marine areas. Information on, for example, living and non-living resources, bathymetry, spatial extents (boundaries), shoreline changes, marine contaminants, seabed characteristics, water quality, and property rights can all contribute to the sustainable development and good governance of coastal and marine resources. 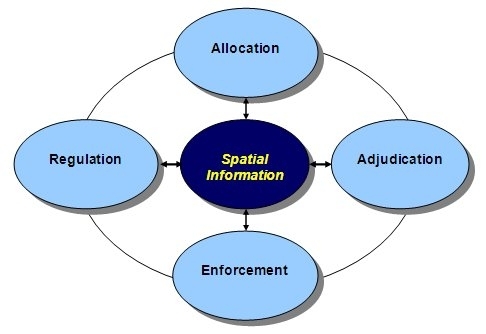 All of these types of information have spatial components and therefore spatial information is important to the good governance of marine spaces (Figure 2) [Sutherland, Wilkins and Nichols, 2002]. Boundary information is one type of spatial information that is essential in the management and administration of marine spaces. However in some cases it may be better not to focus on boundaries, as boundary uncertainties (e.g., as with federal and provincial boundary uncertainties in some coastal regions in Canada) are sometimes the cause of social and administrative conflicts in coastal and marine spaces. Recent governance research supports the relevance of imprecise or ill-defined boundaries insofar as the existence of these boundaries is not a catalyst for dispute [Nichols, Monahan and Sutherland, 2000]. The precise delimitation of boundaries usually become important in relation to the need to allocate equitable resources perceived to be dissected by the potential boundary [Hildreth and Johnson, 1983]. For example, such is the case with the boundary dispute between Nova Scotia and Newfoundland [Arbitration Tribunal, Nova Scotia-Newfoundland Dispute, 2002]. When considering marine environments from a right-based perspectives, one ought to consider that in one column of the marine environment there are rights to the surface of the water column (e.g. navigation), to the water column it self (e.g. fishing), to the seabed (e.g. fishing and mineral resources), and to the subsoil (e.g. mineral resources). The very nature of the marine environment requires that rights be considered in terms of at least three dimensions, in snapshot, and more practically in four dimensions considering that rights to marine spaces change over time. Technically, therefore, tools developed to manage and administer rights to marine spaces should consider the inherent multidimensional nature of those rights [Ng’ang’a et al, 2004]. Concepts such as the marine cadastre or marine administration systems have been discussed in many academic papers as technical means for aiding in the management and administration of rights in marine spaces. Any technical tool such as a marine cadastre or marine administration system is faced with the challenges of not only dealing with the multidimensionality of rights to marine spaces but also with the fact that in many international jurisdictions there is the added complexity of overlapping interests (e.g., jurisdictional rights, administrative rights, title, leases, customary rights, aboriginal rights, public rights, etc.). The design of marine information systems dealing with the management of rights information ought to take the possibility of overlapping and co-existing rights into consideration [Ng’ang’a et al, 2004]. The management of marine spatial information is an asset to the efficient management of marine resources, and can in many instances help to avoid minimize conflict among the many stakeholders. Recognizing this, and the fact that no one stakeholder possesses all necessary information, many jurisdictions have begun initiatives to better manage coastal and marine spatial information and to apply information technology and concepts to the management of marine spatial information [Ng’ang’a et al, 2004; Nichols, Monahan and Sutherland, 2000]. In order to coordinate the dissemination of marine spatial data that can support good governance of coastal and marine spaces, marine geospatial data infrastructure initiatives are underway in many parts of the world. Initiatives such as Canada’s Marine Geospatial Data Infrastructure (MGDI) and the U.S. Federal Geographic Data Committee (FGDC) are considering the information and other infrastructure components necessary to provide geographically dispersed stakeholders with spatial data to support governance decision-making. Regional bodies such as the Permanent Committee on GIS Infrastructure for Asia and the Pacific (PCGIAP) are also taking steps to implement marine geospatial infrastructures. The components of any marine geospatial data infrastructure are expected to include key spatial data, computer network infrastructures, spatial data management software and other software, data- and other standards, metadata, stakeholders, and possibly a spatial data clearinghouse. 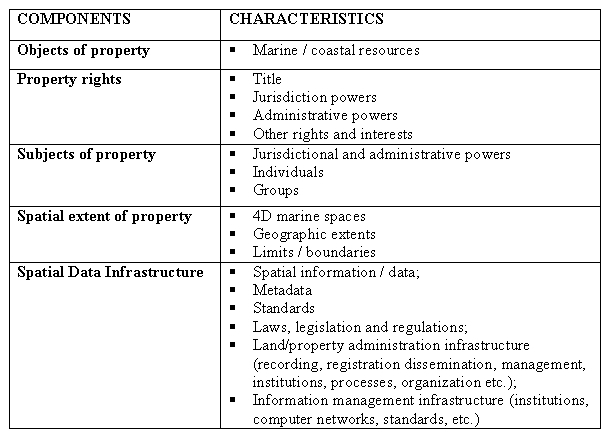 Table 1 shows spatial data infrastructures as part of a marine information system from a property rights perspective. Tidal boundaries along coasts in North America are defined in law either by the “intersection of a specific tidal datum with the shore” or by “tide marks left on the shore by the receding waters of a particular stage of tide” [Nichols, 1983]. Internationally this is more or less true. Because tidal datums are related to specific sea levels and therefore subject to temporal and spatial variations, and because the marks left by tidal actions on shores also vary with the changes in sea level and tides, boundaries defined by these methods are sometimes subject to ambiguous positioning in 3-dimensional space. Constant tidal action against the shore can cause the deposit of material on the shore or the erosion of shore material and therefore the physical configurations of shorelines are subject to constant change [Flushman, 2002; Lamden and de Rijcke, 1985; Nichols, 1983]. This means that resurveys are sometimes necessary in order to keep coastal boundary information up to date. These and other factors are issues in defining coastline boundaries and therefore indirectly affect the governance of marine spaces since, for example, the implementation of jurisdictional and administrative rules and regulations often depend upon defined boundaries. As on land, traditional or local knowledge can play an important role in marine governance. Unfortunately the value of local knowledge is not always appreciated or is ignored because: it is not standardized; it is not considered ‘objective’; or it is difficult to obtain. However science has only begun to give a picture of the vast ocean territory, even near the coast. We have snapshots and sporadic data, which like lead line depth measurements, leave much to be discovered and understood. Local knowledge is an asset not to be underestimated in filling in those gaps, validating the scientific sample and theories, or in understanding the interconnection within ecosystems. Fishers along the East and West Atlantic coasts, for example, could have advised the scientists who helped governments who established fishing quotas in the 1970s-1990s that many north Atlantic the fish stocks were declining, long before the science driven government policies endangered the fishing resources. A multidisciplinary approach is needed in the governance of marine spaces. Surveyors, lawyers, planners, and resource managers all understand part of the picture. To be complete or even useful, any information system to support marine governance needs to reflect the variety of interests, their complexity, and the unique aspects of marine interests. The emphasis should not necessarily on precise boundary delimitation. Many of the boundaries and limits are undefined or un-delimited until an issue arises. Others are fuzzy or moveable by nature and best serve the interest of stakeholders that way. The sheer number of overlapping and coexisting interests in four dimensional space means that new approaches to presenting appropriate information are needed. Rather than imposing a land-based system (i.e., grids, straight lines and co-ordinates), the focus should be on helping stakeholders and decision makers visualize the complexity and multiplicity of interests. Co-management arrangements may be a better option than management of zones and geographical areas defined by boundaries if governance is to be inclusive and recognize all interests. Co-management (e.g., networking of information sources) will also be necessary in developing truly useful information systems, rather than a single agency approach. The oceans provide an opportunity to not make the same mistakes we have made in land resource management and land information systems. Perhaps what we can create for marine space can help to improve our governance and information systems on land. Arbitration Tribunal, Nova Scotia-Newfoundland Dispute (2002) http://www.boundary-dispute.ca/. Accessed March 2002. Black, H. C. (1979). Black’s Law Dictionary Fifth Edition, by Henry Campbell Black (5th Ed. By the Publisher’s Editorial Staff), West Publishing Co., St. Paul, Minn. 1979. Charette, N. and A. Graham (1999). "Building partnerships: Lesson learned." In Optimum, Vol. 29, No. 2/3. Chiarelli, B., M. Dammeyer and A. Munter (1999). "Why regions matter: Perspectives from Europe and North America". In Gouvernance, No. 1, March. Cockburn, S. and S. Nichols (2002). “Effects of the Law on the Marine Cadastre: Title, Administration, Jurisdiction, and Canada’s Outer Limit.” Proceedings of the FIG Congress, Washington DC, USA, April 24, 2002. DeBlois, P. and G. Paquet (1998). "APEX Conference 1998: reflections on the challenges of governance." In Optimum, Vol. 28, No. 3, pp. 59-69. Flushman, B. S. (2002). Water Boundaries: Demystifying Land Boundaries Adjacent to tidal or Navigable Waters. Wiley Series in Surveying and Boundary Control. Handy, C. (1996). "Finding sense in uncertainty." In Rethinking the Future: Rethinking business, principles, competition, control & complexity, leadership, markets and the world. Reprinted (1997). Ed. Gibson, R., Nicholas Brealey Publishing, London. Hildreth, R. and R. Johnson (1983). Ocean and Coastal Law. Prentice-Hall, Inc., New Jersey. Hoogsteden, C., B. Robertson, G. Benwell (1999). "Enabling sound marine governance: Regulating resource rights and responsibilities in offshore New Zealand." In Proceedings of the New Zealand Institute of surveyors & FIG Commission VII conference & Annual General Assembly, October 9-15. Kyriakou, D. and G. Di Pietro (2000). "Editorial." In The IPTS Report, No.46, June 2000. Leroy, A.S. (2002). "Public Participation and the Creation of a Marine Protected Area at Race Rocks, British Columbia". Masters of Science in Planning Thesis, School of Community and Regional Planning, University of British Columbia, 137pp. Manning, E. (1998). "Renovating governance: lessons from sustainable development." In Optimum, Vol. 28, No. 3, pp. 27-35. Masson, C. and S. Farlinger (2000). " First nations involvement in oceans governance in British Columbia." Paper presented at Coastal Zone 2000 conference, Saint John, NB, September. Meltzer, E. (2000). "Oceans governance: A paradigm shift or pipe dream?" Paper presented at Coastal Zone 2000 conference, Saint John, NB, September. Ng'ang'a, S. M., M. Sutherland, S. Cockburn and S. Nichols (2004). "Toward a 3D marine cadastre in support of good ocean governance: A review of the technical framework requirements." In Computer, Environment and Urban Systems, 28 (2004), pp. 443-470. Nichols, S. (1983). “Tidal Boundary Delimitation.” Technical Report # 103, Department of Geodesy and Geomatics Engineering, University of New Brunswick, Canada. Nichols, S., D. Monahan and M. D. Sutherland (2000). "Good Governance of Canada’s Offshore and Coastal Zone: Towards and understanding of the Maritime Boundary Issues." In Geomatica, Vol. 54, No. 4, pp. 415-424. Nichols, S., O. Chouinard, H. Onsrud, M. Sutherland, and G. Martin . “Adaptation Strategies” Section 4.8 in Impacts of Sea-Level Rise and Climate Change on the Coastal Zone of Southeastern New Brunswick, R. Daigle, ed., Environment Canada (in press). Paquet, G. (1994). "Reinventing Governance." In Opinion Canada, Vol. 2, No. 2, April. Paquet, G. (1997). "Alternative service delivery: Transforming the practices of governance." In Alternative Service Delivery: Sharing governance in Canada. Eds. Ford, R. and D. Zussman, KPMG • The Institute of Public Administration • University of Ottawa Libraries. Paquet, G. (1999). Governance Through Social Learning. University of Ottawa Press. Rosell, S. A. (1999). Renewing Governance: Governing by learning in the information age. Oxford University Press. Savoie, D. J. (1999). Governing from the Centre: The concentration of power in Canadian politics. University of Toronto Press. Sutherland, M. D. (2005). “Marine Boundaries and the Governance of Marine Spaces”. Ph.D. Dissertation (University of New Brunswick) and University of New Brunswick technical paper, 2005. Sutherland, M. D., K. Wilkins and S. Nichols (2002). "Web-Geographic Information Systems and Coastal and Marine Governance." In Optimum, Issue 3, Spring 2. United Nations (1982). United Nations Law of the Sea Convention. New York: UN. Walker, D.M. (1980). The Oxford Companion to Law. Oxford: Clarendon Press. Dr. Michael Sutherland is a graduate in land information management from the Department of Geodesy and Geomatics Engineering, University of New Brunswick, Canada. He is currently engaged in marine environment-related research activities at the School of Management, University of Ottawa and Department of Oceanography, Dalhousie University, Canada. He lectures part-time at Ryerson University, Canada. Michael is a member of the Canadian Institute of Geomatics, and is Chair of the International Federation of Surveyor’s Working Group 4.3, Commission 4 (hydrography, coastal zone management, ocean governance, and marine cadastre). Dr. Sue Nichols is a Professor in Land Administration and Property Studies at the University of New Brunswick and has conducted research on tidal and marine boundaries for over 20 years. Sue is a Past-President of the Canadian Institute of Geomatics and has been on the Advisory Committee for the Canadian Minister of Natural Resources. She engaged in research as Project Leader on a multi-year, interdisciplinary research project on "Good Governance of Canada's Oceans: The Use and Value of Marine Boundary Information" that included examination of boundary uncertainty, marine cadastre, and other issues related to ocean governance.